Image caption Critics of traffic management fear it could lead to a two-tier internet. The UK's biggest broadband providers are to give clearer information about how they slow down users' connections to maintain their network performance. BT, Virgin Media and Sky are among the companies that will publish details of their "traffic management" policies. 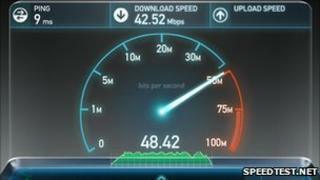 The firms say they want to help customers understand why they need to vary connection speeds. The code of practice has been drawn up by the Broadband Stakeholder Group, which represents most of the UK's large internet service providers (ISPs). "There is a core of consumers who understand this stuff quite well, but it's not something that most people are aware of at this stage," said Anthony Walker, chief executive of the Broadband Stakeholder Group. Mr Walker said that most companies already make information about their traffic management policies available, but the new guidelines meant that they would all use the same simple format - allowing customers to compare ISPs. Members signing up to the code will have to give details about how much they reduce speeds, how long the reduction lasts and whether certain services are blocked, slowed down or prioritised. Most internet service providers (ISPs) vary the speed of broadband connections depending on the time of day or volume of traffic on their network. Tasks that are not speed critical, like downloading files or sending emails, are delayed slightly to ensure that other services, such as streaming video, run smoothly. Most analysts agree that some form of traffic management is necessary. "Go and ask someone on an ISP that doesn't use traffic management," said Andrew Ferguson, editor of the independent website Thinkbroadband.com. "When congestion kicks in on a Friday night, they are the people who can't go and play on their Xbox Live, they can't play PlayStation online, because latency [network delay] has gone through the roof. Many ISPs have begun exploring the possibility of offering "managed services" - effectively giving an exemption from traffic management to website and online applications that are willing to pay for it. The idea has been met with widespread opposition from proponents of net neutrality, who believe that all internet traffic should be treated equally. "We recognize that there are certain types of traffic shaping that need to occur in order to maintain the integrity of the network," said Jeff Lynn from the Coalition for a Digital Economy (Coadec). "But we see that as very different from developing business models in which a particular ISP takes money from 4 on Demand [for example] and makes it easier to download 4oD videos than it does BBC videos," said Mr Lynn. Jim Killock, executive director of the Open Rights Group, said that transparency on its own was not enough: "We need meaningful guarantees that ISPs will not act to restrict competition. "If competition and innovation on the net suffers, that will damage the whole UK economy." The Broadband Stakeholder Group's code of practice includes provision for ISPs to explore managed services: "offering a guaranteed quality of service for specified content, services or applications." However, that explicit mention of managed services does not constitute a declaration of intent, according to Mr Walker. "This document doesn't take a view on whether that is a good thing or a bad thing. That is part of a wider policy debate," he told BBC News. "If those services do start to emerge, it is really important that both consumers and policy makers are aware of it so that any policy or regulatory framework is based on clear evidence about what is happening in reality rather than just speculation or conjecture about what might happen." The code will be piloted by BSkyB, BT, O2, TalkTalk, Three, Virgin Media and Vodafone during 2011, with a review of how it is working in the following year. Campaigners for net neutrality suggest that ISPs are only adopting voluntary measures in the hope that they will stay the hand of legislators and regulators across the UK and Europe. There is some evidence that may be working. The UK's telecoms watchdog, Ofcom, launched a consultation on the issue of traffic management in 2010. It has yet to publish any findings, although it welcomed new the code of conduct. Last November, the culture minister Ed Vaizey said that ISPs should be able to explore the use of managed services as a way of financing the UK's growing internet infrastructure. And European lawmakers also appear to be moving towards a more hands-off approach, opting to let the market decide. The EU's Digital Agenda Commissioner Neelie Kroes recently suggested that mobile users who found themselves disconnected for using Skype should "vote with their feet" and change provider. Net neutrality: Are all bits created equal?